We accept membership graduates from our Authorized Training Centers who fulfill certain pre-requisites. They should be pre-qualified as a medical doctor, nurse or in an allied health professional or have a substantial complementary therapy. Please refer to Education page. Graduates from ozone organizations or training schools outside of the UK are welcome to apply for a membership if they fulfill the Ozone Society pre-requisites for training and possibly undertake some further study if required. Medical Ozone Therapy is taught at postgraduate level as an adjunctive therapy with only the relevant human biology and clinical science, biochemistry, clinical pathology, and practical tuition necessary to carry out the therapy itself. Courses do not include a wider human biology and clinical science tuition. Ozone Society members are a skilled group of Medical, Holistic, and Naturopathic practitioners who practice Medical Ozone Therapy. We welcome membership applications from therapists who share the same philosophy and have a good understanding of Human Biology, Clinical Science, Biochemistry, and Clinical Pathology. 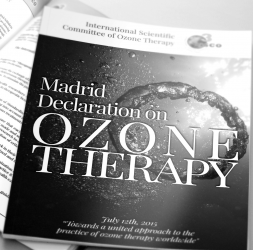 Many Holistic and Naturopathic sciences have been regulated in recent years so we are now able to clarify the existing Ozone Society pre-requisites for membership, working from NOS (National Occupational Standards) and core elements published by regulatory bodies such as the Department of Health (DH) International Guidelines for Ozone Therapy and the Madrid Declaration. Please refer to the Education page for more information on training and prerequisites. The list is not definitive but gives information as to the type of therapies that may be considered and each application will be given individual consideration and assessed on its own merit. If you have any doubt or questions, please feel free to contact us. New graduates who comply with the above and who have successfully completed an Ozone Society recognized training course who have not practiced Ozone Therapy previously OR whose membership has lapsed for more than one year. Practicing certificated overseas Ozone Practitioners not wishing to practice in the UK and who wish to network and receive our mailings. Medical Ozone Therapist who have been practicing for 5 years or more in the UK are acceptable to the Ozone Society. ALL PROBATIONARY AND FULL MEMBERS ARE OBLIGED TO CARRY FULL PROFESSIONAL INDEMNITY AND PUBLIC LIABILITY INSURANCE. HOLD CERTIFICATES IN MEDICAL OZONE.